Home > News > A Month of Merriment is Heading Your Way! There’s tons of festive cheer to end the year at your local Bookmans this December! Of course, you can’t have much Christmas cheer without a visit from Santa Claus! Bookmans has been in touch with jolly ol’ St. Nick and he assures us that he will be visiting with all the kids at our Bookmans stores! It’s a good idea to mail those letters to him ahead of time, and that’s exactly what we’ll be doing on December 1st at Bookmans East with our Letters to Santa event. Bisbee Breakfast Club’s East location is providing cookie snacks for the kids. We’re also working with Alex’s Free Little Library in Tucson to get those letters mailed ASAP so they’ll get a letter back! To get your photos taken with Santa in Tucson, head over to Bookmans Northwest and Midtown. Santa will also be in Phoenix on the 15th, at Mesa on December 22, and sipping cocoa at snowy Bookmans Flagstaff. Considering getting or giving a pet for the holiday? Be sure to visit Bookmans East for their Santa Paws pet adoption event! 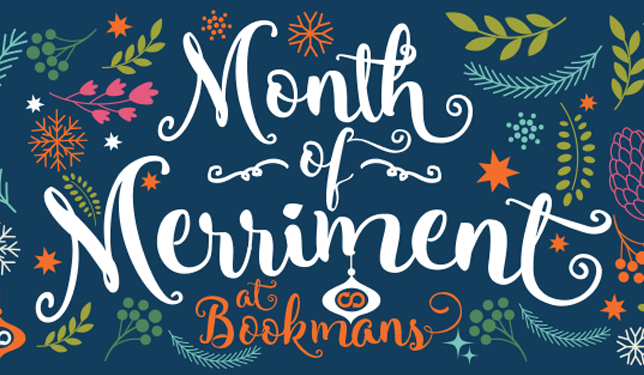 On December 1, Bookmans will also be at the Community Holiday Ornament Party at HeatSync Labs in Downtown Mesa, Phoestivus Open Air Market at, Merriment on Melrose, and Merry Main Street – “Gingerbread Rock. 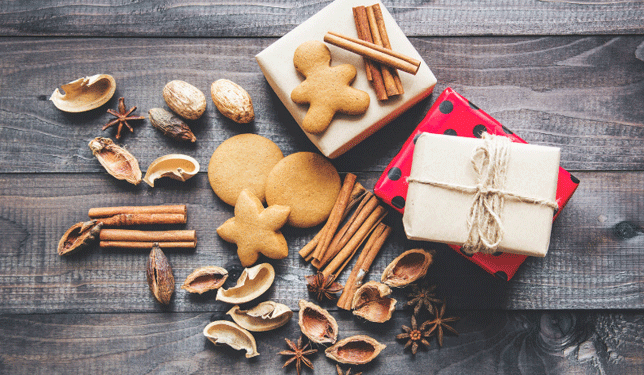 What’s easier than grabbing the perfect gifts for everyone on your list all in one place? Having them wrapped too! That’s why Bookmans Northwest’s Wrap it Up with Project Linus event is going to be packed! We need your votes in Tucson because some local high schools are competing in the first ever Bookmans Upcycled Holiday Decoration Challenge! For every vote counted, Bookmans will donate .25 to Youth on Their Own – up to $500 for the holidays! Do you love to discover and meet authors? This December, Bookmans is the place to be to find your next favorite writer! Join Bookmans East on December 8 for the Winter Author Fair. On December 5, author Marcia K. Morgan will be at Midtown to sign copies of her book Go! Bookmans Mesa will also be on hand for the Mesa Book Festival Downtown on December 8 where you can get to know some amazing authors outdoors. Bookmans is always proud to be a sponsor of the Children’s Stage at the KJZZ Holiday Storefest & Author’s Showcase too! For the musically inclined, Bookmans has a lot of festive fun this month! We’ve got three ukulele events coming up for masters and novices alike. First up are the Ukulele Holiday Jamboree in Flag and the Ukulele Party at Mesa on December 8. After Christmas, Phoenix is having a Ukulele Jamboree! Midtown has always a respite for music fans, and they’re celebrating music with their bi-monthly Ambient Salon Showcase and the brand new Synth Meet-Up events! Crafters of stories, garments, and spun works will want to mark their calendars for the upcoming Studio Night: Make Your Own Scarf at Northwest, Creative Spirits Studio Nights at Bookmans Flag, and the Studio Night: Handweavers at Midtown. A new year can bring about a new you, and Bookmans East wants to help you envision your future with Studio Nights: New Years Resolutions. Bookmans Northwest is taking a different route to show you your future with a Tarot Forecast event. Bookmans Flag sought out some practical future tips for the college-bound with their Winter Workshop With Northern Arizona College Resource Center. 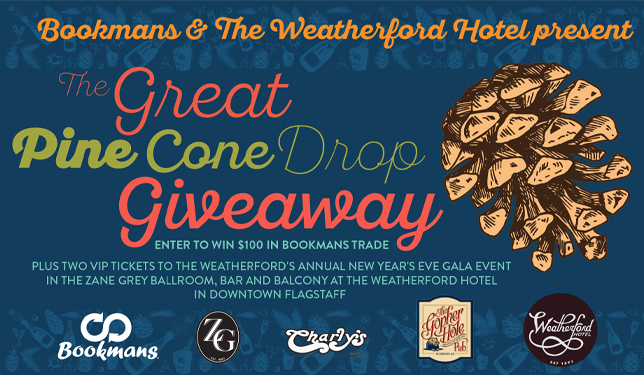 You can also be a BIG WINNER this new year because Bookmans Flagstaff is giving away VIP tickets to The Great Pine Cone Drop Giveaway at the Weatherford Hotel throughout December! You have until December 29 to enter and score those VIP tickets PLUS a $100 Bookmans gift card! We wouldn’t dream of leaving gamers out in the cold this December either. We’ve got an RPG Game Night and a Board Game Night Hosted by the Arizona Game Fair coming up at Mesa. Board games are also in store at Midtown’s Board Game Night event. Dungeons & Dragons is hotter than ever, and Bookmans wants to be your D&D destination! Our Northwest store has not one but two D&D events on December 22nd and 23rd while everyone will be rolling 20-sided dice at Dungeons and Dragons 101 at Midtown on the 26th! If video games are more your speed, don’t miss Bookmans Flagstaff’s Mario Kart Double Dash On GameCube Tournament or Midtown’s SuperSmash Bros Melee Tournament, both on December 8. There are also plenty of Pokemon Meet-ups, Pileups, and Pokemon League – Hosted by Team Rocket AZ events at your local Bookmans! Phew! That’s a lot of free events, but believe it or not, there’s even more happening each and every day at a Bookmans store near you. There are also tons of gifts for every member of the family. We’ve got everything from premade gift baskets, gift cards, journals, video games, and so much more! Welcome to the World of Dungeons and Dragons!